We’d love your help. 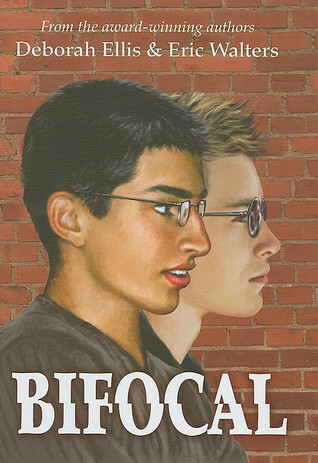 Let us know what’s wrong with this preview of Bifocal by Deborah Ellis. Two bestselling authors join forces to write a powerful novel about racism. These are the issues at the heart of Bifocal, a ground-breaking new novel for young-adults. To ask other readers questions about Bifocal, please sign up. the book was very interesting was the book that cool? A powerful and friendship-driven story which tackles the issue of racial profiling, Bifocal is a short yet very impressive novel. I get it. Racism is bad. Religious intolerance is bad. In this post-9/11 world we live in, danger can come from anywhere and it's very easy for anyone to be accused of terrorism and this is also bad. I PROMISE, YOU HAVE MADE YOUR POINT. I understand and respect what you were trying to do with this story - having one of you write from the perspective of a white football player and the other write about a Muslim Afghan boy and then tossing them together at a high school where a Muslim student has been arrested as a suspected terrorist was a good idea for a story. I just don't particularly love the way you both chose to go about telling the story. For starters, both the main characters (Jay and Haroon) are, for lack of a more polite word, pussies. Everyone around them has strong opinions and actually does something about them; Jay and Haroon are always just sort of going along for the ride and trying not to draw attention to themselves. It is frustrating when you have to root for a pair of fence-sitters who are, really, sort of spineless. Also, the ending was a total letdown. You set up this whole interesting premise where a group of suspected terrorists has been arrested, and one of them is a sixteen-year-old boy. But do you tell us anything about the actual trial? Do we get to see a trial or know how this kid was connected to the other suspected terrorists? Do you even tell us how the police decided to arrest this kid? No, you do not. I realize that this is realistic, but just because something is realistic doesn't mean it'll make a good story. Good storytelling involves tying up loose ends, and your story starts multiple threads and then just leaves them dangling so we can watch Jay and Haroon do nothing some more. So in conclusion, I understand what you were trying to do with this story. I just didn't really understand why you decided to tell it the way you did. PS: I don't know what made Eric Walters think he could write accurate teenage dialogue, but he was wrong. So very, very wrong. He sounds sort of like whenever that guy who writes Family Circus decides to throw in an American Idol reference to remind his audience that the comic doesn't take place in the 50's - misguided and a little sad. s it a longing for order, ethnic magnetism, or adolescent xenophobia that makes high school lunchrooms such showcases for segregation—or is that “niche societies? At Bifocal’s Central Secondary, a high school in an unnamed Canadian metropolis, there’s a section for the kids from India, Pakistan, and the Middle East called Brown Town. There’s a place over by the doors, nearly outside, for the Goths and “emos,” who are “sort of diet-Goth.” The black kids sit in Cafrica near the Asian kids who dres s it a longing for order, ethnic magnetism, or adolescent xenophobia that makes high school lunchrooms such showcases for segregation—or is that “niche societies? At Bifocal’s Central Secondary, a high school in an unnamed Canadian metropolis, there’s a section for the kids from India, Pakistan, and the Middle East called Brown Town. There’s a place over by the doors, nearly outside, for the Goths and “emos,” who are “sort of diet-Goth.” The black kids sit in Cafrica near the Asian kids who dress like blacks and are called Jackie Chans. Of course, as anyone who went to high school knows, the jocks sit nearest the food and the pretty, popular girls sit where the jocks can see them. The authors’ strategy for creating this book about bigotry and fear is ingenious: the text is written by two people, alternating the points of view of two different characters. Eric Walters, a social worker and coach with forty-six books to his name, writes from the perspective of a white athlete, Jay, a rising football star being groomed for the position of captain in his senior year. The book opens with Jay and other teammates climbing through a ceiling to get some perspective on a “lockdown” situation at the school. From their elevated position, they vocalize both wonder and contempt for the SWAT teams, bomb squads, and fleets of police that surround the school. The other main character of the story, Haroon, has an entirely different take on the proceeding. It was in his classroom that the trouble began when police burst into his “Reach for the Top” rehearsal (an inter-school quiz competition) and cuffed him and the only other “brown” kid in the class, Azeem, for charges unknown. Deborah Ellis, the author of the Haroon segments, is a peace activist who has traveled the world to hear the stories of children marginalized by poverty and conflict. This was a really enjoyable read. Told by the two main characters with alternating viewpoints, the book tackles a number of controversial issues which could lead to some excellent class discussion. Haroon and Jay are two senior boys from vastly different racial backgrounds,trying to survive in an ethically divided high school which has worsened since 9/11. We share their experiences, perceptions and participation in a number of events including physical violence and verbal attacks. Neither of th This was a really enjoyable read. Told by the two main characters with alternating viewpoints, the book tackles a number of controversial issues which could lead to some excellent class discussion. Haroon and Jay are two senior boys from vastly different racial backgrounds,trying to survive in an ethically divided high school which has worsened since 9/11. We share their experiences, perceptions and participation in a number of events including physical violence and verbal attacks. Neither of the two boys is perfect, they both make mistakes as they try to deal with everything going on around them. While I found Haroon the more convincing character, Jay was still likeable. I liked it, even though it is VERY flawed, with a few inconsistencies, but it gets the point across (although both authors are white, and far removed from their teenage years). Additionally, it deals almost completely with the AFTERMATH of the lock down of the school due to "terrorist" activities and focuses on students were not a part of the suspected terror cell. A thought-provoking look at racial profiling, told from two points of view: Jay, the white high school football star and Haroon, the (brown) Muslim academic. Although a bit simplistic in part, it would be a great discussion starter in the home or classroom. It looks not only at prejudice based on religion or skin colour, but also at the way we begin at, an early age, to judge others based entirely on their appearance. I really enjoyed this novel. I love the dual perspective on such a tough topic. This book was a quick and easy read. Despite being called Bifocal, you actually learn about a number of character's perspective. This is a nice companion to To Kill a Mockingbird for grade 9 or 10 students. It gives them insight into the modern racial tensions. It’s a good book but a lot of the stuff are wrong. It’s not accurate at all for the facts they give about Islam. Thoughtful, balanced, likeable characters and as always with Debora Ellis, I learned something about myself as well. Bought the book to share. Read with my grade 6 class. It has lots of great messages!! Why isn't anybody/everybody talking about this book?!?!?! I realize this came out a while ago (2007) and Deborah Ellis is famous in some circles but not others yet I have no idea why this title has not received more publicity and recognition. This book is amazing. Ellis and Walters (they wrote the book together) created an incredibly engaging and thought-provoking novel that, at times, can make you uncomfortable but gets you thinking and asking questions about our own stereotypes and prejudices Why isn't anybody/everybody talking about this book?!?!?! I realize this came out a while ago (2007) and Deborah Ellis is famous in some circles but not others yet I have no idea why this title has not received more publicity and recognition. This book is amazing. Ellis and Walters (they wrote the book together) created an incredibly engaging and thought-provoking novel that, at times, can make you uncomfortable but gets you thinking and asking questions about our own stereotypes and prejudices in a way that doesn't sugar coat yet leaves you feeling hopeful and optimistic. The story is told through two alternating points of view. Jay is a white high school football player who has a limited understanding of Islam and thinks he's a tolerant (non-racist) person because he has friends from various cultures. Haroon is a third generation Afghan-Canadian who feels very "normal" and mainstream yet he experiences a lot of prejudice on account of his skin color and faith and is mistaken for an Islamic terrorist. It's a very down-to-earth story with very little flashiness or exaggeration. The two perspectives are striking because they are different and show how different these two teens' lives are but what's even MORE interesting to me is seeing how SIMILAR they actually are. I enjoyed the supporting cast of characters possibly even more than I enjoyed reading about Jay and Haroon. Haroon's sister Zana is fantastic for standing up for her faith and against prejudice even when it was not easy. I liked Steve a lot -- his mixed-race perspective added another dimension and I absolutely loved the part where he and Jay talked after their prank. It was such a heartfelt and real moment that sort of made it "click" as to why hate is so pointless. I obviously disliked Kevin but people like him exist so we need to find ways to deal with them and stand up to their messages of hate. I also liked Ms. Singh (even though she was a big preachy) and I really loved Haroon's parents. They were not stereotypes and they showed that even though they are immigrants (second generation) and even though they are Muslim, they are not close-minded and actually have very progressive views on life and freedom. Jay's part was written by Eric Walters while Haroon's was written by Deborah Ellis. Jay is a white boy that likes to exercise and Haroon is 3rd generation Canadian Persian who is really intelligent. The story takes place in three places, Jay's house, Haroon's House and their school, it is in the present time. The book starts with a lockdown and Jay decides to go to the top of the building, which he isn't allowed to, and Haroon stays in his classroom. When the chaos is over the police blames Haroon for being a suspect. This is the first clue of racism in the book and as it goes on it increases and shows how every story can have two different sides some can be good and others can be bad. I think this book is very well written because it combines the stories of both narrators and main characters, Jay and Haroon. The way it switches makes it more interesting and easy to read. I think that if the book was only narrated by one of the characters it would be a completely different story with totally different views. This book really made me more open minded and I think anyone who reads it and takes it seriously wil feel the same as me. Even if it is a fiction book things like this happen in the real life. The way it changes of perspective it makes you feel as if you were in their place, feeling what they feel and everything. I also really liked the end of the book because it has a lot of meaning and represents friendship in all races, religions and cultures. Jay is a relatively new kid at school, but as a good football player he's already managed to integrate himself into the team and the coolest crowd at school. He's even managed to become good friends with the team captain and quarterback, and it looks likely he'll be recommended for captain next year. Haroon is a quiet kid who's a backup for the "Reach for the Top" team, an academic TV competition. He's also a Muslim, his grandparents having emigrated from Afghanistan long before. But things star Jay is a relatively new kid at school, but as a good football player he's already managed to integrate himself into the team and the coolest crowd at school. He's even managed to become good friends with the team captain and quarterback, and it looks likely he'll be recommended for captain next year. Haroon is a quiet kid who's a backup for the "Reach for the Top" team, an academic TV competition. He's also a Muslim, his grandparents having emigrated from Afghanistan long before. But things start to change for both of them when a terrorist plot is uncovered and a student is arrested and accused of being part of it. Haroon takes that boy's place on the academic team after nearly being arrested right alongside him, and Jay begins to see signs of prejudice and hatred even among his friends. The beginning of the book set the scene as the terrorist attack was happening. It also introduced the characters. For me, the beginning and the end of the book were the most exiting parts; through the middle it just kept re-explaining the same scenario over and over again. It was extremely boring, it seemed like the authors were trying to make up time in the book. There was a lot of repetition. The end of the book is where the main action was, and the problems started being solved. But the very ending was made me really mad. The main question was never solved. In the begging of the book, Azeem, Haroon’s friend was arrested because he was accused of being in a terrorist organization. The whole time we are waiting to find out if he is guilty or not, and we never find out! It is more realistic this way, but it also made me feel like reading this book was a waste of my time. This book is good in the fact that it educates people about racism and also different religions and cultures. It seemed to be aged towards 13-18 year olds. Although it was a difficult read, it still educated me. Overall, I did not enjoy this book. It could have been a great book, if it was executed properly. Normally one would think a book written by two professional authors would have been twice as good, but this is not the case. I think that they might have under or over thought the book too much. This book starts off quite confusing but you catch on; this book is by two authors that I really look up to so why wouldn't I pick up this book!? It starts with two boys and you get introduced to them by thinking what they are thinking. The chapters alternate between characters. Jake and Haroon. Jake is a "typical white boy". He gets decent grades, is on the football team and is pretty popular but nothing un-ordinary. Haroon is a Muslim boy whose parents originated from Afghanistan. Is really sma This book starts off quite confusing but you catch on; this book is by two authors that I really look up to so why wouldn't I pick up this book!? It starts with two boys and you get introduced to them by thinking what they are thinking. The chapters alternate between characters. Jake and Haroon. Jake is a "typical white boy". He gets decent grades, is on the football team and is pretty popular but nothing un-ordinary. Haroon is a Muslim boy whose parents originated from Afghanistan. Is really smart and is on a "Reach to the Top" team (a quiz like show team). When a alleged terrorist is at there school, Haroon starts to get a bit off attention from the local authorities. And things at there school are not the same. In their minds they are completely different but they are more like each other then they think. I finished this book because it is quite suspenseful, not only that but the idea of discrimination always seems to concern me. A very good book for all ages and people! There is a lot of mystery in this book, and sometimes you could even call it a scary book. The thing I liked most about this book are the characters. They are so different but still so alike, and they have two totally different worlds. At the end of the book the characters don't feel like two characters anymore, but turn into one whole, magical character. This book is one of the best books I've ever read. It is one of those books you don't want to put down A very good book for all ages and people! This book is one of the best books I've ever read. It is one of those books you don't want to put down. This book was a very good read. I felt nervous when I would put it down because I felt lile I left someone in a situation. The book deals or is about two different boys and how their worlds collide. Both characters are telling the same story,but fromtheir point of view. They both do a great job of explaining what they live due to stero types and clicks in school. I wonder how many Jays and Haroons are out their? In their own way and live, but int he same idea of worries and problems. I reallt could This book was a very good read. I felt nervous when I would put it down because I felt lile I left someone in a situation. The book deals or is about two different boys and how their worlds collide. Summary: This novel divides the point of view of two culturally different boys, Jay and Haroon, and how they view and are viewed when a bomb threat is posted at their high school. Jay is a popular football player where Haroon likes to be an invisible Muslim. We see how both boys are affected by this threat and how they come together to view each other as equals. Review: I thought this novel was very interesting. This novel really proves that there are two sides to every story and that some will Summary: This novel divides the point of view of two culturally different boys, Jay and Haroon, and how they view and are viewed when a bomb threat is posted at their high school. Jay is a popular football player where Haroon likes to be an invisible Muslim. We see how both boys are affected by this threat and how they come together to view each other as equals. Review: I thought this novel was very interesting. This novel really proves that there are two sides to every story and that some will be impacted positively and others will be negatively impacted by a situation. This novel was definitely a page turner and I wish there was a sequel. I found this on a swap shelf at our school and immediately picked it up because I remembered this was used in a class by a former colleague and friend (still a friend, but now far away). To my delight, this is in fact her book, so I can benefit from all her margin notes! Not only did I enjoy the story but at times I could almost hear her voice exclaiming and commenting on the book. This would be a good one for a class, with the same events observed from very different perspectives. The end is a b I found this on a swap shelf at our school and immediately picked it up because I remembered this was used in a class by a former colleague and friend (still a friend, but now far away). To my delight, this is in fact her book, so I can benefit from all her margin notes! Not only did I enjoy the story but at times I could almost hear her voice exclaiming and commenting on the book. Note: While I critique both purchased and free books in the same way, I'm legally obligated to tell you I received this book free through the Amazon Vine program in return for my review. Blah blah blah. This is an amazing novel that examines how the war on terror affects students in a large high school. Co-written by Deborah Ellis and Eric Walters, it focuses on the lives of two students (one Caucasian and one Islamic). This novel is written in a realistic tone, and there is no obvious antagonist as each character reveals how they are personally struggling with race issues. In summary, this is an honest and thought-provoking book written by two excellent writers. This is an amazing novel that examines how the war on terror affects students in a large high school. Co-written by Deborah Ellis and Eric Walters, it focuses on the lives of two students (one Caucasian and one Islamic). This novel is written in a realistic tone, and there is no antagonist as each character reveals how they are personally struggling with race issues. In summary, this is an honest and thought-provoking book written by two excellent writers. Jay and Haroon are teammates on the football team. At their high school one day, there is a complete lockdown, this is not a drill lockdown. The police, swat team swarm the building and take away Azeem, a Muslim like Haroom. He is accused of terrorist activity. Suddenly the lines between the Muslims and the rest of the student population grow much darker. Haroon finds out he does have the courage to stand up for what is right, no matter who disagrees with him.